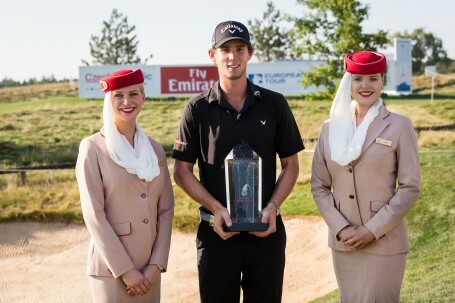 Emirates, the first and only operator of the A380 in the Czech Republic and official partner of the European Tour, will for the third consecutive year sponsor the annual D+D REAL Czech Masters, the premiere Czech golf event of the year, in its continued commitment to its Czech and sports fans worldwide. Held from 18–21 August, the tournament will once again take place at Albatross Golf Resort in Prague. This year, Emirates will host a Facebook competition for two flight tickets to Dubai and two hospitality tickets to watch the final leg of the Race to Dubai, the DP World Tour Championship, which will be held on 19 and 20 November. The competition is open to both tournament attendees as well as Emirates Facebook fans. In addition, the 16th hole will be exclusively branded by Emirates, where the first pro to get a hole in one will win two round-trip business class tickets to any of Emirates’ 154 destinations worldwide. The Emirates Prague-Dubai route, serviced by an iconic Emirates A380, operates as EK 139, departing Dubai at 0905hrs and arriving in Prague at 1325hrs. The return leg operates as EK 140, departing Prague at 1555hrs and arriving in Dubai at 2355hrs.